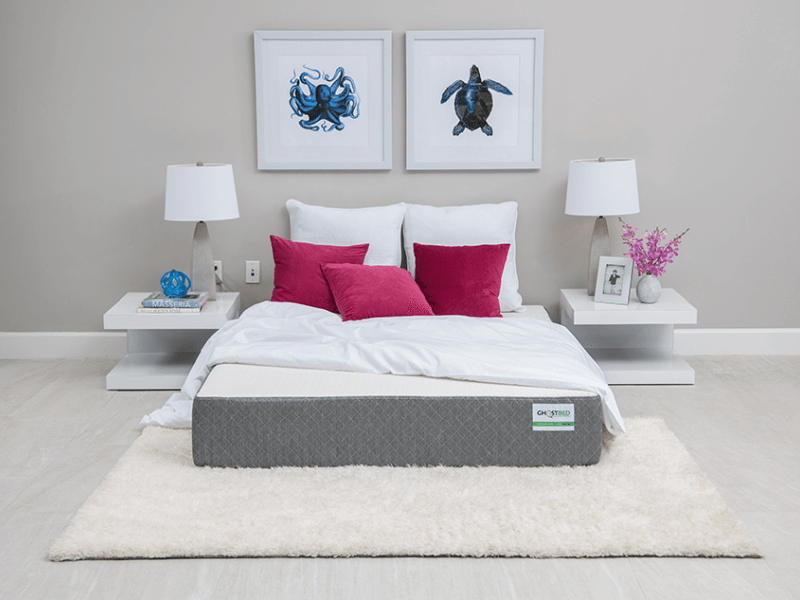 Launched in 2015, GhostBed is a relatively new name in the bed-in-a-box industry; but parent company Nature’s Sleep has been manufacturing and selling mattresses and related products wholesale for over 15 years. Named after CEO Marc Werner’s childhood fear of ghosts under his bed, GhostBed is the natural evolution of a tightly run family business; and is specifically marketed for young consumers. From wholesale roots, GhostBed is leading Nature’s Sleep in its foray into direct sales. The GhostBed mattress is a hybrid foam mattress, which means that the inside is made up of various types of top quality foam arranged in precise layers. Unlike old and traditional mattresses, the GhostBed mattress does not benefit from flipping, as the product has a definite top and bottom. American designed and handcrafted, this 11-inch mattress purportedly offers deep compression support, aids in proper spinal alignment, and helps you get a comfortable night’s sleep. On average, it’s also thicker, more durable and more resilient than its industry counterparts. Most competitors offer 10-inch mattresses with a 10-year warranty; GhostBed offers an 11-inch mattress with a 20-year warranty. On top of this, materials that make up the GhostBed mattress are approved by CertiPUR-US. No harmful chemicals are used; off-gassing has minimal odor and only natural flame retardants are used. The one-and-a-half-inch top layer is made of premium continuous aerated latex foam with a density of about 3.5 PCF (pounds per cubic foot). The latex is the synthetic rubber type, used primarily because it is hypoallergenic, very stable and easy to process. This very responsive layer is meant to provide bounce, cooling, and comfort to GhostBed mattress sleepers. It gives you that natural contouring feel and a great deal of pressure relief, without allowing too much sinkage. The two-inch middle layer is made of proprietary gel memory foam with a density of about 4.0 PCF. The unique gel infusion formula used to make this layer works together with the aerated latex on top of it to keep temperatures cooler and more conducive to uninterrupted, restorative sleep. The gel beads all throughout the foam actually absorb heat. This layer is the real core of the GhostBed mattress. The seven-and-a-half-inch foundational bottom layer is made of high density support polyfoam with a density of about 2.0 PCF. This increases longevity and resiliency of the product; giving it enough structural support and durability to withstand more pressure and weight without sacrificing comfort. 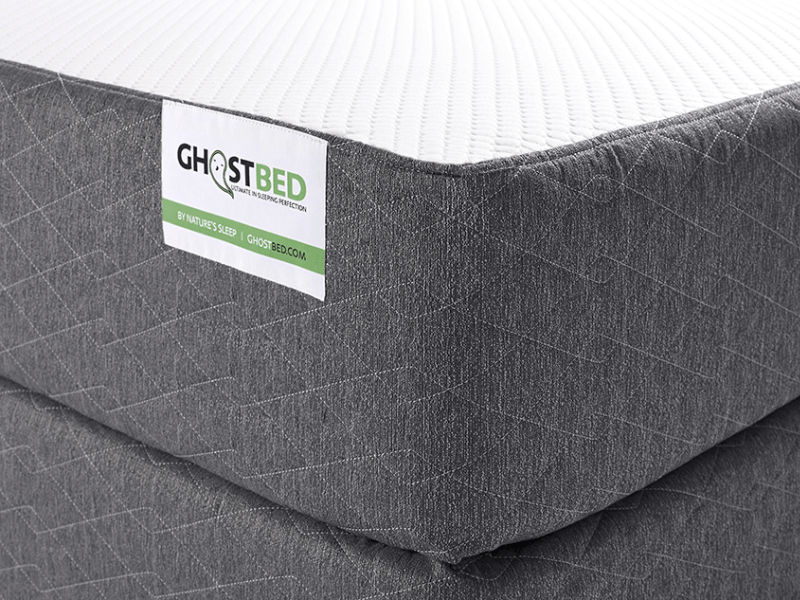 Most industry counterparts stick to a thinner bottom layer ranging from four to five inches thick; the closest to what GhostBed offers is Tuft & Needle‘s seven-inch base. Not only is GhostBed’s bottom layer one of the thickest around, but it’s also one of the most dense; for comparison, industry leaders Casper and Leesa have both designed mattresses with bottom layers that have a density of 1.8 PCF. These foam layers are stacked and encased in a fiberglass scrim—a woven material that acts as a natural and completely safe fire barrier—before being placed in a mattress cover made of fabric blend that contains polyester and viscose. While it feels thin and snug, it is actually a little plush; adding to the overall comfortable feel of the mattress. It’s machine washable, too! The quilted side panels also add a little structure and durability. Shipping and handling is available within the US only; free for the continental 48, but with a $600 freight fee added for Alaska and Hawaii! Note that sales and deliveries to the latter areas are also deemed final. This lack of consideration for residents outside the contiguous US is a little bothersome, but ultimately only an issue if you are directly affected. The GhostBed mattress is available in six standard US mattress sizes: twin, twin XL, full, queen, king and California king. It’s on the heavy end; but not extremely so, like the Purple mattress. To compare: a queen-sized GhostBed is 85 pounds, heavier than an Endy or Leesa, but around the same as a Casper or an Eight; and still nowhere as heavy as a queen-sized Purple, which is about 110 pounds. Looking for a more plush, more cooling option? Check out the GhostBed Luxe mattress. GhostBed also makes and sells compatible and matching products: a foundation, a mattress protector, and a GhostPillow. Should you need a mattress cover replacement later on, GhostBed provides that, too; just contact them directly for it. They are one of the few that offer this for free. Although GhostBed does recommend the use of the matching foundation—which comes with its own three-year warranty—the mattresses can be placed on any firm and solid surface. This includes adjustable bases, bunkie boards, and even the floor. If you are going to be using an existing box spring or platform left over from a previous bed setup, just make sure that it is still perfectly serviceable. Placing a GhostBed order on the official website and receiving the delivery at your doorstep is the same as it is with most online purchases. You enter some information, click a few buttons, and then wait until your mattress is shipped. It is recommended that you make time to receive your package in person delivery, as handling an unanswered door is up to the deliveryman’s discretion—some will leave it at your doorstep, and some will return another day. Good thing that GhostBed orders ship within 24 hours of placement. GhostBed suggests unboxing your new mattress within six months getting your order. The sooner, the better, though; opening it upon delivery ensures a better chance of proper decompression and expansion of the product, and it allows you to fully take advantage of the sleep trial the mattress comes with, too. Remember: GhostBed’s vaunted and industry-leading 101-night sleep trial begins on the day your mattress is shipped. This means that if you want the maximum amount of time and unbox the mattress at six months, you will no longer be able to return it should the product leave you unsatisfied. The new mattress should fully expand within 24 hours of being unrolled and unpacked. However, in colder climates or during winter months, the GhostBed mattress may take several days to fully decompress. If you notice a “new mattress smell”, just air it out until the smell dissipates. Once it’s back to its original size—remember, the thickness is supposed to be 11 inches—you can sleep on it right away. GhostBed claims that their mattress can support an industry-leading 750 pounds; though when we reached out to the company, they clarified that this number is the total weight capacity per product, and not maximum limit per sleeper. This capacity remains the same for both single sleeper mattresses like the twin and twin XL, and two sleeper mattresses like the queen and king. However, the company also claims that when the GhostBed mattress is paired with their all-wood matching foundation, the weight capacity is bumped up to 2,000 pounds! They also recommend their California king-sized mattress for heavier sleepers, saying that increased surface area will distribute and support weight better. The GhostBed mattress suffers from the typical problem that mattress-in-the-box products experience: the company says that the design is universally comfortable, but it is not. In truth, this claim is a failure in the making; firmness and comfort, after all, are subjective. If you are a big fan of very soft memory foam mattresses, for example, you may find the GhostBed mattress too hard; if you are used to sleeping on a Japanese futon laid out on the floor, you may find the GhostBed mattress too soft! We do concede, however, that the “Goldilocks”-type complaints about the GhostBed mattress we’ve come across during our research seem to be all over the place, and often extreme. Thousands of online customer reviews—most from verified purchasers of GhostBed mattresses—do point to a positive experience overall. On Amazon, it’s rated an average of 4.2 out of five; Google’s average is 4.6 out of five; and on the official website—powered by Yotpo—the average is about 4.5 out of five. There is a sizable percentage of negative reviews that can be attributed to a misunderstanding regarding the sleep trial and return policy—we’ll touch on that more later—and not to actual problems with the product. There are also problems attributed to the mattress not expanding to its full size even after days of waiting; which, again, has to do with the delivery and setup, and not the actual feel of the mattress. The best thing about GhostBed is that it’s backed by an established company that knows the mattress industry inside and out. Nature’s Sleep are sold through both big and small online and physical retailers; like Costco, Macy’s and Kohl’s. The parent company has even been a vendor on Groupon. 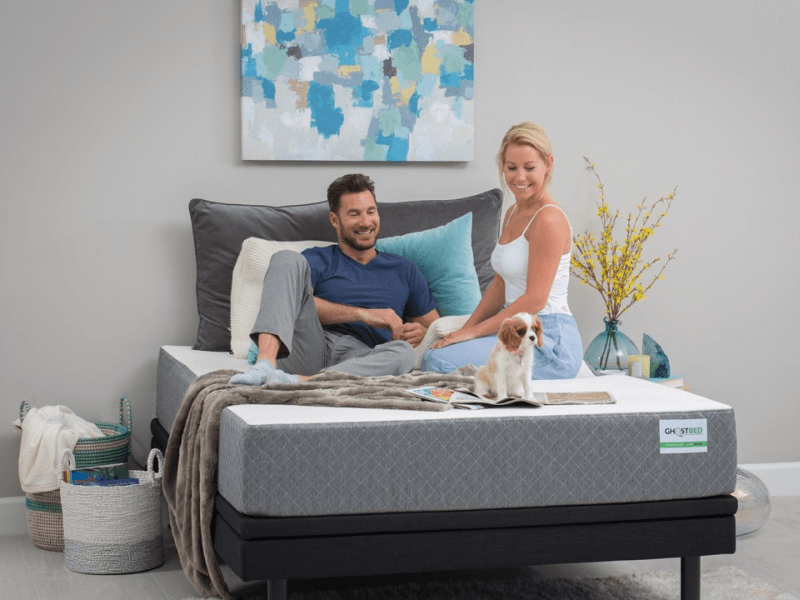 GhostBed is marketed as a great mid-range option for 35-and-under consumers which may find Nature’s Sleep and other luxury brands like Tempur-Pedic or Serta too expensive. Worth mentioning here is that GhostBed is one of two defendants—the other being Honest Mattress Reviews—of a lawsuit filed by competitor Purple. As this is a developing story, this current situation will not affect Good Night’s Rest reviews in any way until the situation is resolved. For more information on the case, you can read the case’s September 2017 preliminary injunction here. GhostBed offers a 20-year mattress warranty, though past the first 10 years mattress replacement will be subject to a prorated charge, plus additional transportation costs. Note that many experts also do recommend simply replacing your daily mattress every 10 years for health and hygiene purposes; so though a 20-year warranty may sound impressive and friendly, in truth it’s only a little bit better than the standard 10-year warranty most competitors offer. There is also the 101-night sleep trial, which honestly might as well be the industry standard length, though it’s touted as above average. Other brands that truly offer more than the usual 100 nights—such as Brooklyn Bedding, Nolah, or Novosbed—typically add 10-25 days. Competitor Nectar even offers a 365-night sleep trial! Note also that the trial period starts when the mattress ships and not when your receive it; a minor detail, considering that GhostBed ships within 24 hours of order placement, but still another cop out. Returns are easy, though again it must be noted that sales delivered outside the contiguous US are final. Also: 101-night trials and returns are honored only on orders placed directly on the official website. If you bought your GhostBed mattress on Amazon, the return policy is different and must be processed by Amazon; this is a source of much frustration and the cause of numerous negative reviews. (Edit: No longer true!) Customer service otherwise is very friendly and easy to access; there is an email address and a telephone number you can use to contact GhostBed, and even helpful live chat on the official website. For any miscellaneous concerns there is even comprehensive FAQ page, separated into handy sections based on subject and product. Again—we cannot stress this enough—sales are final if you are requesting delivery to Alaska or Hawaii. You may have more luck purchasing from a retailer with a separate return policy that may service these U.S. states. The GhostBed mattress is a curious case. The company makes numerous claims of the product’s industry-leading features—universal comfort, weight capacity, trial period duration, warranty coverage—but in our opinion these assertions are tenuous at best. However, we do appreciate quite a number of things about the mattress; namely the thickness and the overall higher density of the foams used, because these do point to more support for heavier sleepers, as well as an increased level durability and usable lifespan. The removable and machine washable mattress cover is also a big plus; and the fact that you can contact them for a replacement cover is very encouraging to would-be lifetime customers. Bottom line: if you live anywhere in the continental US, do try out the GhostBed mattress and purchase it directly from the company. Should the product fail to satisfy your needs, you can always return it and recoup the cost. Otherwise—we’re talking to you, Alaska and Hawaii residents—the cost is not worth the risk of purchasing something that is, in the end, proven by a sizable number of customer reviews to be not universally comfortable.